On Monday it was my husband Jason’s birthday. 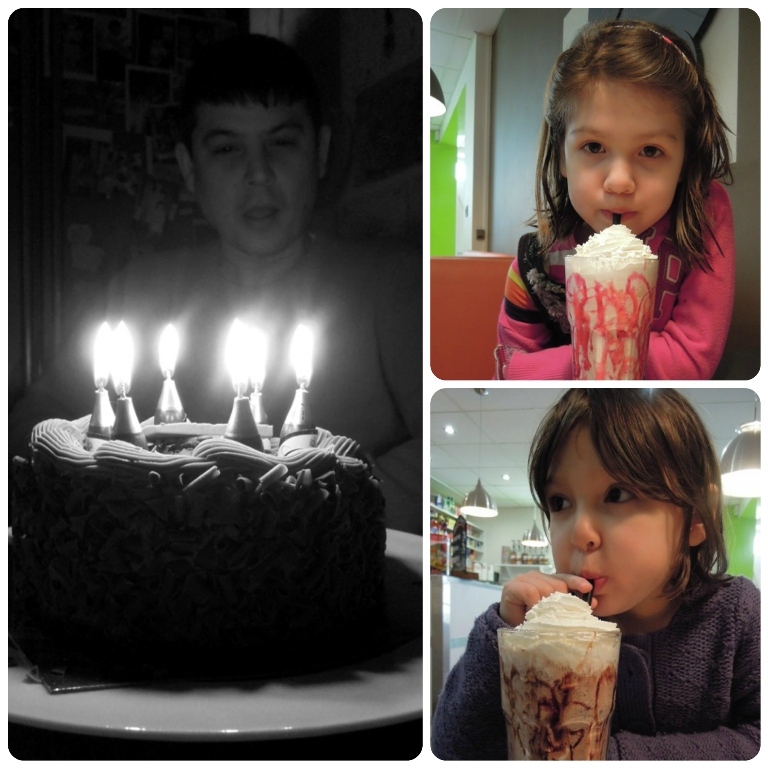 We celebrated with scrummy milkshakes and smoothies at lunchtime at Great Shakes in Wells and later a delicious ‘homemade’ dinner bought from COOK, followed of course by cake. I love the look of surprise on Jason’s face to see yet another birthday cake. Yesterday it was my daughter Jessie’s go as she turned eight. Now how did that happen? It really does not seem eight years ago Jason and I returned home from hospital with our scrawny little bundle. We got home and put Jess in the middle of the living room in her car seat for a while, just looking at her, wondering what on earth we were meant to do next. And now look at her – our beautiful big girl with such curiosity, creativity and a thirst for life. It’s hard to keep up with her sometimes but we wouldn’t have it any other way. Jessie’s big day involved a meal at a restaurant with her very best friends, followed by a movie. We watched Oz The Great and Powerful in 3D, thoroughly enjoyed by both the children and adults alike. The kids were especially thrilled with their 3D specs as they offered lots of opportunities for to pose for photo after photo as we attempted to get them all home after the film. We took the children to Frankie and Benny’s for food beforehand – not normally my restaurant of choice but it happened to be right next to the cinema. I have to say though, for a group of kids, it was absolutely perfect and they had a whale of a time. Especially when our waitress switched off the lights and played Congratulations by Cliff Richard as she brought out the birthday cake. Jessie’s friends will be teasing her about how red she went for quite a while I bet! Fortune teller (or whirlybird) kits in the party bags also went down well. Thanks to Lia at Dizzy Loves Icy for that idea. Coming up with silly fortunes kept them all entertained while they waited for their pizzas and burgers to arrive. Jessie shares her birthday with her Grandad Chris, my Dad, who yesterday celebrated his 60th birthday. We didn’t get to see him unfortunately as he’s in London and we’re in Somerset but Sue, my Step Mum treated him to a slap up meal at Wild Honey in Mayfair, lucky thing. As my Dad is renowned for his love of music, various members of my family have been extremely busy the last few weeks compiling a very special music compilation for him, featuring a different song to mark every year of his life, from 1953 right up to the present. 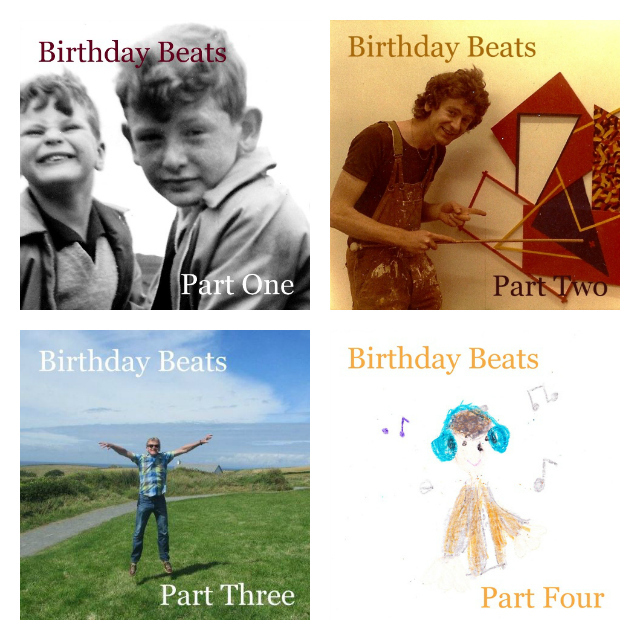 We called the album Birthday Beats and the 60 tracks filled four CDs. Do you like the artwork? Artists on Birthday Beats range from Perry Como, Elvis Presley and Dave Brubeck in the 50s; through Charles Mingus, Sonny Rollins and The Beatles in the 60s; The Pointer Sisters, Al Green and The Jam in the 70s; Penguin Cafe Orchestra, Talking Heads and The Housemartins in the 80s; right through to Blur, Bjork and The Fugees in the 90s; and Taj Mahal, Ojos de Brujo and Medeski, Martin & Wood in the last decade (I hate to say noughties). It was such good fun putting the album together and I think the final selection reflects just as much on the family that compiled it as it does on my Dad’s evolving taste in music through the last six decades. And because this is a food blog, I really need to end this post with a recipe. So here’s a simple recipe for an easy peach pudding I remember my Dad making us when I went down to stay during the school holidays. It’s probably a bit far-fetched to describe this a recipe, as it’s simply three ingredients layered one on top of the other in a bowl. But when I was little I thought this was one of the most amazing desserts ever created and I still love it to this day. Break the biscuits into two bowls or glasses. 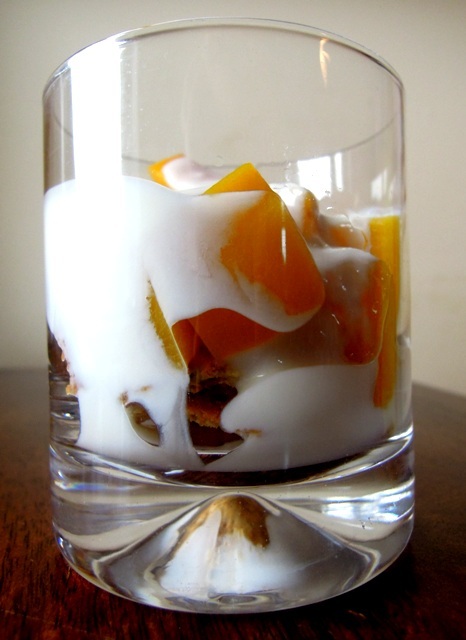 Place the chopped peaches on top, pour over the yoghurt, and serve. Sounds like you had a lot of fun (and a lot of cake!). My eldest had a birthday yesterday too – he’s a teenager now! There’s far too much cake in this house now…! Thanks Elizabeth! If you have any clever uses for leftover cake, do share! Indeed! And how was your lunch at Wild Honey? sounds as if you’ve all had a great time. Assume no cake recipes from you for a while though! You’re right – there definitely won’t be any cakes on here for a while! Hi Vanesther – LOVE making albums for people myself, it’s such a nice bday pressie. I keep meaning to do a post that links up music and food, they are natural bedfellows! Birthday Beats sounds amazing, I’d buy it! ; ) P.S. Tinned peaches all the way..! Hi Nana – how lovely to see you here! Thanks so much for the comment. And yes my mouth is definitely watering. Your cakes are the best!